RIO DE JANEIRO, BRAZIL – The Clover Irish Pub on the beachfront Avenida Atlântica in Copacabana is under new ownership as of early last month when a pair of American expatriates were handed the keys. The new owners are looking to keep the same formula, but revamp the place with a new menu, live music, and more international sports on TV. 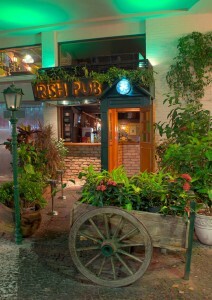 The charming entrance to ‘The Clover Irish Pub’ in Copacabana, photo courtesy of The Clover. The Clover originally opened in October 2012 under Brazilian ownership and was what Eric Porter and Ian Knight, old friends from high school turned business partners, had spent eighteen months searching for as a business opportunity in Brazil. “The location speaks for itself. Beach front on the most popular beach in the world. And if anyone has met our staff, they could not ask for a better experience in personality, competence, and attentiveness… We felt like this was meant to be our type of opportunity in order to be successful here in Rio,” said Porter. The bar was not for sale at the time, but Porter explained that once they found it they “walked in and made an offer,” and a week later the current owners called back, and they started negotiating. The expatriates said they experienced their fair share of obstacles in the purchase, but with the help of legal fixers Judicial Care, things were able to move forward. “We ran into problems in every aspect, but we had good lawyers to help… We feel Judicial Care is by far the most competent, organized, and caring company in Rio. Without Helio and Adriano we without a doubt would not be in Rio,” explained Porter. In terms of what to expect, one of the biggest changes is the new owners have obtained a license for live music and are going to bring bands to the venue. Sticking to the Irish Pub roots they are principally planning to book rock groups, performing Thursday through Saturday to start. 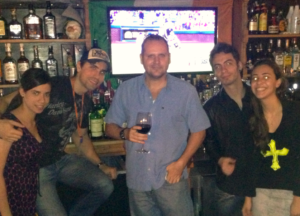 Co-owner Ian Knight and some of the staff at The Clover, photo by The Clover Irish Pub. While Rio is a beach culture city, not to mention the epicenter of Carnival, The Clover is looking to offer something different than the average Carioca-style bar. “One of our customers told us, ‘You’re an oasis in a land of samba!’” Knight explained. Another of the big changes they’re looking to make is in the kitchen. Knight and Porter want to bring more variety and flavor to the menu with pub-food fundamentals like American-style sandwiches and some Mexican classics like nachos. The bar also promises to show sports from around the world. In addition to local Rio and Brazilian sports events, The Clover will also air foreign sports including, but not limited to American NFL, MLB, NHL, and NBA and European football (soccer). The duo aspire to open several expatriate-centered sports bars and pubs around Rio and consider The Clover to be the first of a bright future. “We’re trying to keep it simple: sports, live-music, good menu, good beer selection,” Porter explained. Congratulations. You and Eric have hung in there with a vision and navigated the shark infested waters to to get The Clover. WTG, When is the grand opening party? ?